← A gift from Lehigh. Part I. A gift from Lehigh. Part II. 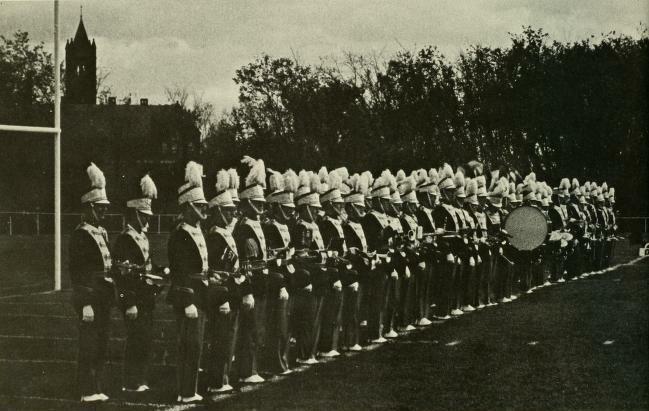 Lehigh University’s Band “The Marching ’97” in 1968. Last week I explained how Sir Arthur Bliss came to compose a fanfare for an American college football team, Lehigh University, who were desperate to defeat their old rivals, Lafayette. 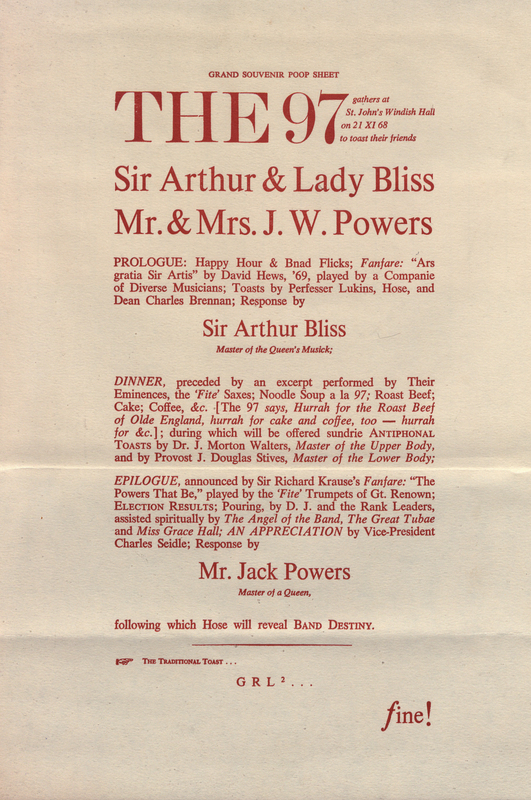 Jonathan Elkus, then director of Lehigh’s Concert Band discovered that the Blisses were in the United States for a performance of another Bliss’ work, and invited them to Lehigh to hear the fanfare and see the game. The Blisses accepted the invitation and were soon en route. 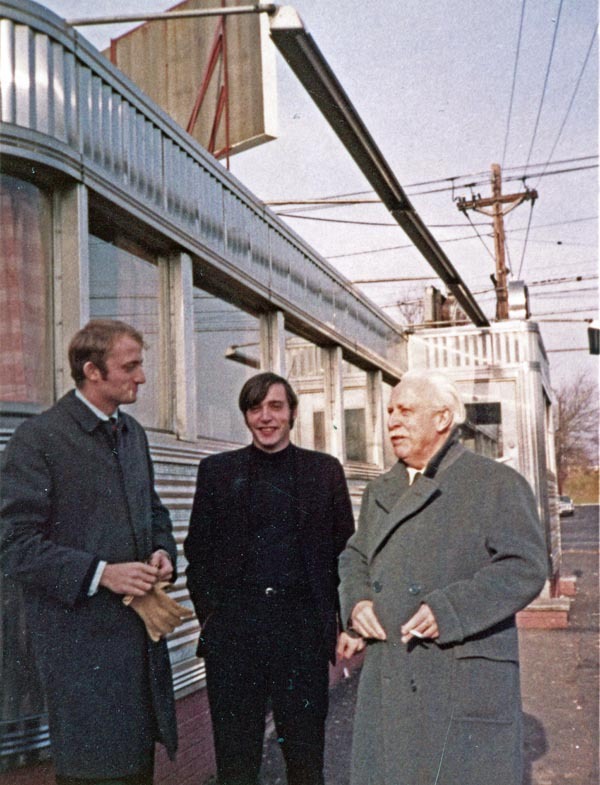 From left to right: David Hotchkiss, David Hughes, and Sir Arthur Bliss at a diner in New Jersey, November 1968. Photographed by Lady Bliss. Courtesy of David Hughes. “Prof. Elkus had entrusted Dave and me with the job of bringing the Blisses to campus from New York City. We had met them right on time at Central Park South (much to Sir Arthur’s delight: “Right on the mark! !”, said he), but, we hadn’t figured on the rather large amount of luggage they were travelling with. So, the entire car trip was spent with me and Trudy wedged into a small backseat, surrounded and cut off by huge leather steamer cases. The conversation in the car (delightfully animated) was thus totally disembodied. So… I was greatly relieved when we stopped for lunch. 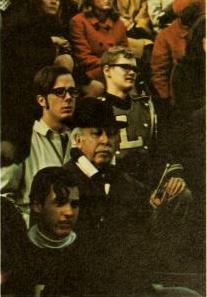 Sir Arthur Bliss at the Lehigh-Lafayette match. Courtesy of Special Collections, Lehigh University Libraries, Bethlehem, Pennsylvania. A toast to the Blisses, courtesy of Lehigh University’s Band. With thanks to Special Collections, Lehigh University Libraries, Bethlehem, Pennsylvania. 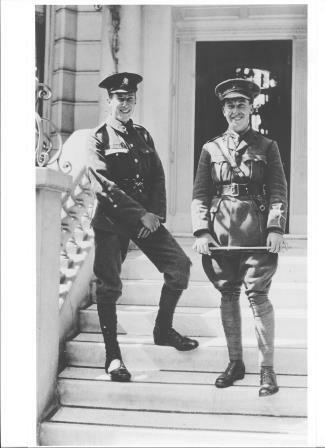 Kennard and Arthur Bliss on the steps of their London home in 1915. “I really didn’t want to, because they are cumbersome and tricky to get through customs, but she insisted, and I did as she asked. When we arrived, she showed me an autograph score in Bliss’s hand. I knew at that time that, during the Great War in 1916 during his convalescent leave following his first wounding, Bliss had composed two pieces for clarinet and piano. These were in honor of his beloved brother, clarinetist Kennard, who had been killed at the Battle of the Somme. Both of these pieces had been lost when Arthur returned to the trenches later in the war. Then, someone had found one of them, entitled “Pastoral” (among a pile of papers apparently unrelated to Bliss), identified it and delivered it to Trudy. Lehigh’s band is still going strong. Indeed they will be in London for the New Year’s Day Parade 2018. Prior to that they are giving a concert in which Salute to Lehigh will be given its European premiere. Sir Arthur, I’m sure, would have been thrilled. This entry was posted in Uncategorized and tagged American football, Arthur Bliss, Composers' archives, friendships, Lehigh University, memorial music, Salute to Lehigh, unusual commissions. Bookmark the permalink.